In 2016, Central Zone patrollers Corbee Dutchburn and Blair Wallhouse brought together two personal passions: CSP advanced first aid (AFA) and motorcycle emergency response. This effort has grown into a patrol of more than 20 people covering many events across Ontario today as the CSP Motorcycle Emergency Response Unit (M-ERU). With an international online following, we expect this exciting team will soon grow across Canada through the support of Central Zone. M-ERU members are all certified CSP patrollers with a passion for motorcycle riding. Additional training is provided under the guidance of trained motorcycle instructors (some are members of various police services) with a focus on safe riding, accident site management on the roadside, interaction with police, fire and EMS and professionalism. Members must also attend an additional motorcycle-specific field day training exercise each year. Motorcycles are provided by each member and must meet certain minimum standards. Outside of Canada, M-ERUs are common and in many countries fast-response motorcycles are used to reach patients and emergency scenes where dense populations, traffic and small streets slow traditional ambulances and quick-response vehicles. Distance, poor weather, obstacles or lack of resources can hinder traditional response, so M-ERUs are a versatile, efficient way to augment traditional EMS response. Safety is the key for any zone considering M-ERUs to bolster their capabilities. M-ERUs have very different riding modalities than police motor units, yet most EMS M-ERUs use police motor unit training and proficiency standards. The CSP M-ERU is working closely with the Toronto Police Service and the International Motorcycle Response Unit Association to create proper training standards. Modern safety gear (required) is advanced and protects riders against bodily harm. One of the primary benefits of M-ERUs is their versatility. Unlike police motor units, which are very similar worldwide, EMS M-ERUs are as variable as the imagination of the organizations that utilize them. In some countries, they are staffed by emergency physicians in addition to paramedics and nurses; in others they are basic life support services only for patients the dispatch centre has flagged as low priority to ensure a higher level of care is not required and in yet other locations, M-ERUs complete with advanced life support gear are used to traverse less accessible urban terrain. Many cities in the United States, and now in the area served by the Central Zone patrol, use M-ERUs for special events and mass gatherings where traditional quick-response vehicle use is impractical. The flexibility is almost infinite. The retention rate is significantly higher than for other patrols, likely because most M-ERU patrollers would probably be riding a motorcycle on their day off so their volunteer environment and hobby overlap in the four-seasons events arena. Generally the cost of running an M-ERU is significantly less than the cost of replacing patrollers year after year. 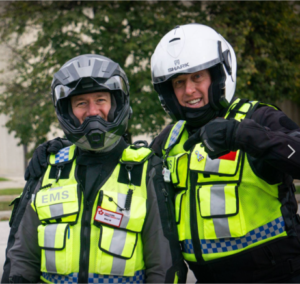 The CSP M-ERU is recognized internationally by the International Motorcycle Response Unit Association (IMRUA), having met all the necessary criteria to be accepted as a full member representing Canada. Corbee Dutchburn will be representing the CSP (Central Zone) M-ERU as the Canadian delegate at the IMRUA World Congress in Slovenia in April, 2019. For more information regarding the M-ERU, please contact Corbee Dutchburn and Blair Wallhouse at motorcycle-eru@skipatrolcentral.com. (l-r) Blair Wallhouse and Corbee Dutchburn.